The former St. Mary’s Hospital, Upper Byron Place. Nuffield has moved its clinical undertaking to the redeveloped Chesterfield Hospital in Clifton and has sold the site. 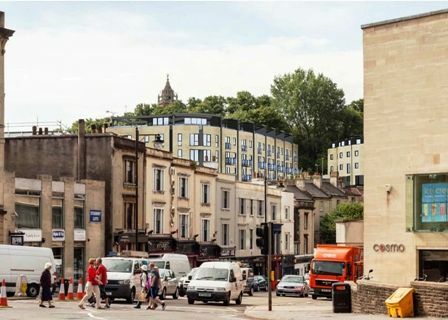 Student Castle who restored and transformed the Grade II* listed Pro Cathedral in Park Place into student accommodation, applied to redevelop the site into student accommodation. The developer lost the appeal against the planning refusal. Early this year, the Council discouraged a planning enquiry that proposed to demolish the site to construct 61 flats and mews houses. A new developer, Pegasus Life, now makes a third proposal to demolish the site to construct 65 retirement apartments. The Society supports residential use and the removal of the unsympathetic extensions behind the main building. The Society regrets that it cannot support the third proposed scheme. The height and mass of three new linked replacement blocks would exceed the height and mass of the buildings proposed in both the earlier schemes. The replacement blocks would increase development, present a large building mass, and stand out strikingly to dominate the townscape. The planning question is the impact of the new buildings on designated heritage assets. The townscape and landscape of Brandon Hill is unique; planning policy recognises them to be heritage assets of high significance. The existing building makes a positive contribution to the landscape. The Society would strongly support redevelopment within the main hospital building, which could provide a substantial number of mixed sized of apartments within a building of character. Such an attractive development in this highly desirable location would be highly marketable. In response to a pre-planning application enquiry, Council Officers have advised Pegasus Homes that they are unable to be support the current scheme due to its excessive bulk and massing. Officers do not consider that the scheme relates adequately to the site’s surrounding context. Officers would welcome a scheme that recognises their criticism. The Society hopes that the developer will now come forward with a plan to adapt the former hospital buildings. The Society supports the demolition of the extensive rear extensions that face onto Upper Byron Place. Empiric Student Properties have bought the site and are consulting about a fifth scheme to provide managed student accommodation. The scheme would retain the original hospital building, demolish and replace the southern glass extension with a new block linked to south end, demolish the extensions on Upper Byron Place to construct a row of 3-storey mews townhouses and construct a new block in the south-west corner of the site. The Society supports the new scheme although the new block in the car park remains controversial. StMarys-3D-views.pdf gives images of the proposed development which illustrate its visual impact on the area. To locate this site, use this link to Google maps.